I know it's Friday, but I'm posting my Stitch Along progress on Sunday so I shoehorned this in here! I managed to find some bunny fabrics at the Quilt and Stitch Village, so they had to come home with me. Please excuse the photos, Photobucket is acting up and I can't rotate or crop photos. I did think I had that bright pink ricrac rabbits, but it turns out I have it in red, so we're OK! I'm still not convinced I don't already have the white-background one above it. The other two are Lewis & Irene. Isn't it great that I always have the full details of all my fabrics! Walking by a stall, a jelly-roll caught my eye. It was Block Party by Sandy Gervais. I was torn between the jelly roll and the layer cake, but the layer cake won. I love the colours in this line. 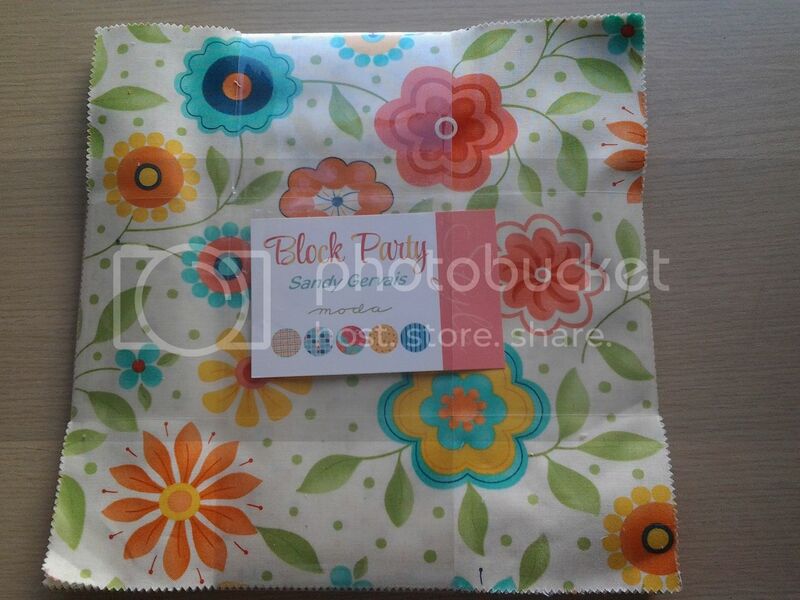 I also received my April fabric for the colour club at Simply solids. 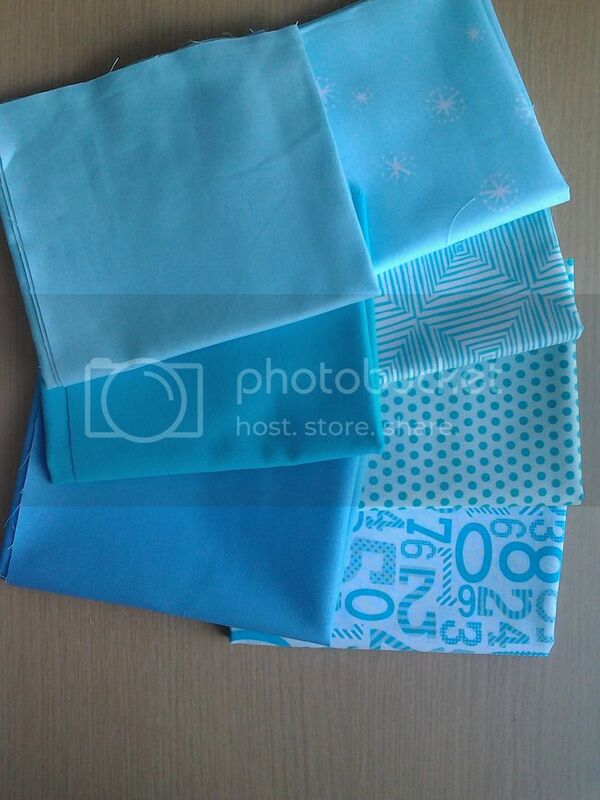 Three Kona blues and... some other fabrics! Wow, the information just flows out of me... I wouldn't be surprised if Molli didn't de-link me. Very pretty fabrics. I'm reading with Miss S on my lap and she especially likes the bunnies. We had to scroll back up and look at them a second time. Happy weekend to you. They are all fabulous and for the most part, I'm the same way with information on fabric!! The blues are beautiful! They remind me of a clear sunny day! 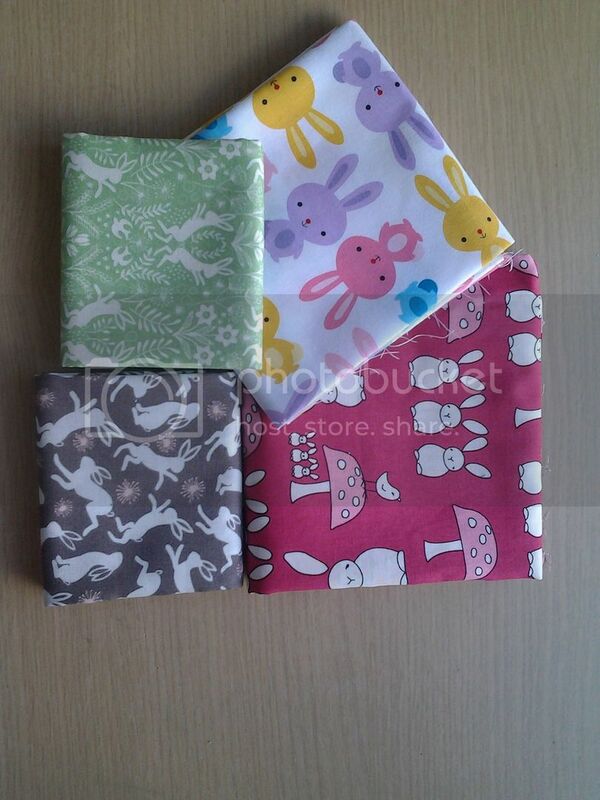 Those bunny fabrics are charming - especially the green one! The bunnies are super cute and the bundle of blues looks great together.